"Hello boys, I'm back!" 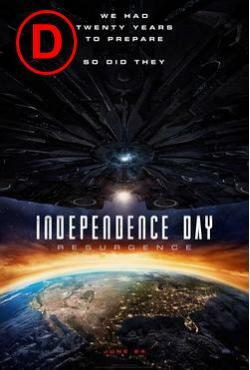 shouted the heroic Russell Casse as he destroyed the aliens ship hovering over the USA in 1996's 'Independence Day'. 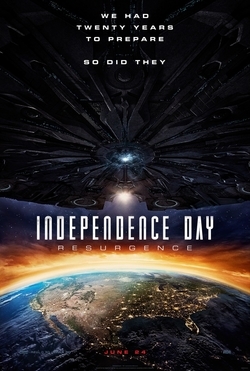 A sequel was often rumoured to happen a lot after the release which excited fans of the film. 20 years later they got their wish but would it be the successful sequel that they wanted? As celebrations on yet another 4th of July draw near, another extraterrestrial mothership this time much bigger attacks earth. The humans futuristic technology developed from the aliens ships 20 years ago wasn't enough to protect the world from the disaster caused by this new attack. 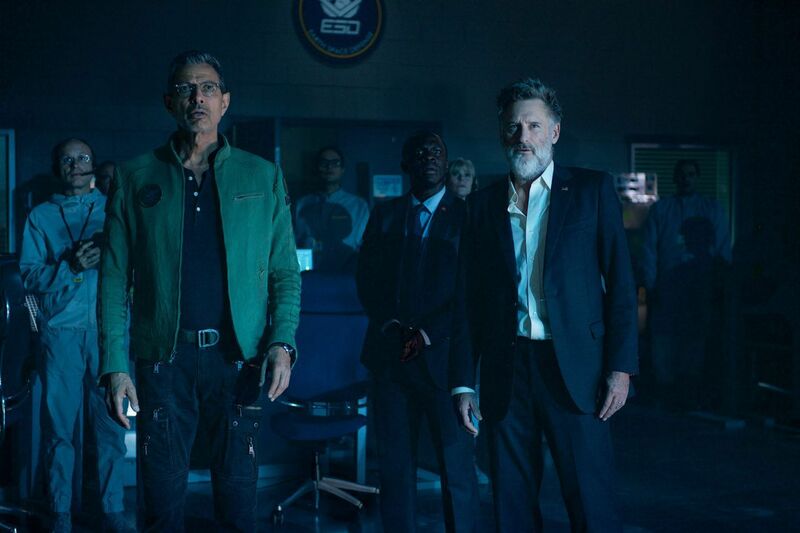 David Levinson (Jeff Goldblum) will need to team up with old allies, the new president and a young, fresh team of fighter pilots to try and save the world. Last year, the world was introduced to another instalment in a franchise in 'Terminator: Genisys'. A movie that really disappointed and hurt the franchise. I didn't particularly enjoy seeing such a beloved franchise and character have something quite as bad be associated with it. In many ways, 'Genisys' is quite like 'Resurgence' as neither were necessary. Both had returning actors that gave us that small bit of hope for the film. Unfortunately, it is just as bad. 'Resurgence' misses the presence of Will Smith and Randy Quaid oh so much in this film. Smith isn't their as the charismatic badass to carry the film and bring the fight to the aliens which also gives us an interesting and entertaining characters. He's not back due to being in 'Suicide Squad'- which looks to be a good decision on his part- and they really failed to replace him. In comes a young team of pilots with Smith's characters son Dylan Dubrow-Hiller (Jessie Usher) leading them alongside Liam Hemsworth's character Jake Morrison. The pair don't carry the film like Smith did as they simply don't have the charisma or presence that Smith carries. Both Hemsworth and Usher's characters are bland and you don't really ever care for them that much which is a huge problem for two lead characters. We also know how well Smith can work with comedy and the way he incorporated that into the first one was great. He also had help from Randy Quaid to help out with the comedy throughout the film and in the different scenes. 'Resurgence' tries to replicate this by having their characters constantly trying one liners. Unfortunately, these do not work either. The jokes don't work well and the delivery isn't good enough either. Nicolas Wright plays Floyd Rosenberg who is a carbon copy of Adam Sandler's character from the awful 'Pixels'. Not only is he unfunny but he is also an ametuer who turns out to be world class with equipment he's never used before. If they looked at 'Pixels' and saw Sandler's character as inspiration, I quite frankly don't know what good can be said about that. Now in a movie like this, especially being directed by Roland Emmerich you expect it to be a whole load of mindless fun action. However I really don't feel that the film delivers on that aspect either. The action really isn't that great and I don't feel there really was enough to create an enjoyable, ridiculous viewing. Instead, we get action that kind of stops for no reason, waits for a convenient build up from the humans and then a restart of action. In a film like this, the action should be flowing especially if it is ridiculous. Due to that not happening, you spend a lot of time waiting for it to restart and also thinking about what has just happened which for the movies sake isn't a good thing. The film does end up going all out crazy in the finale which would've helped if it were present the whole way through. I can say that the highlights of the film for me are the returning characters. Jeff Goldblum returns and as usual, he is enjoyable to watch. He isn't nearly as good as he was in he first film but he is still an enjoyable character to watch in the series. Returning characters also include former President Whitmore (Bill Pullman), Dr Okun (Brent Spiner) and Julius Levinson (Judd Hirsch). Their performances are enjoyable at times but also have some moments that are questionable and really aren't so great. However I do admit that they did have some good moments which made the film more pleasant. In the first film, there is surprisingly a lot of emotion within the film. You care for Smith's Hiller and feel good for him with his success as we see his family and grow to care for them too. We care for the Levinson's as the father and son grow closer to each other which is a joy to watch. Russell Casse brings emotion as he sacrifices himself as his son listens to his final words. These all help the film a lot as you are connected and feel for the characters. In 'Resurgence' this is not existent. This isn't for the lack of trying though as there are moments that could've provided these moments. Unfortunately the execution isn't there and the moments fall flat. Part of the problem may be due to not seeing great interactions beforehand which would lead to you being affected by what has happened. A completely unnecessary sequel that unfortunately isn't any good. 'Resurgence' joins the list of bad sequels and really isn't worth seeing. 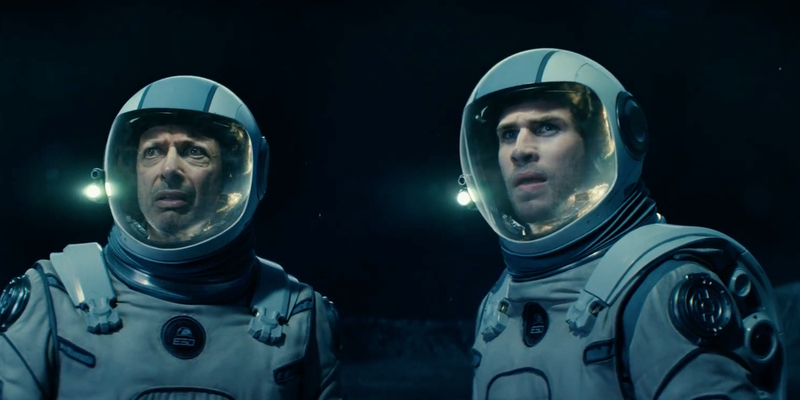 So have you seen 'Independence Day: Resurgence'? If so what did you think of it? I hope you enjoyed reading this review and if you choose to see the film, I hope you enjoy it more than I did. Once again thank you for reading my review, it is much appreciated!